In recent years, many once-disinvested urban areas have become thriving communities, while once-solid neighborhoods have begun to destabilize and deteriorate, changes often unexpected by public officials, community activists, and residents. Greater familiarity with the research on urban neighborhoods, how they work and how they change, might well have helped practitioners anticipate change, and put strategies in place to halt or slow down decline. Researchers have been studying neighborhoods in the United States for over a hundred years. This body of research has given us the ability to understand better what neighborhoods are and how they change over time. The purpose of this brief is to help practitioners learn how researchers have studied neighborhoods and neighborhood change, and understand what factors affect neighborhoods and lead to change. Researchers have looked both at factors that affect neighborhoods, such as poverty or crime rates; and at neighborhood interventions or investments, such as housing rehabilitation or demolition. This information can help practitioners not only better understand what drives neighborhood change, but to better understand what factors are associated with neighborhood vitality, and what impact a particular intervention might have on a neighborhood’s trajectory. As our cities change in dramatic and unforeseen ways, our need to understand neighborhood change has never been greater. While there are many things we still do not know, this research can help us better understand neighborhood change and how to address it as practitioners. 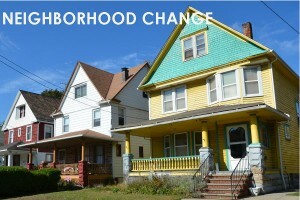 Supplement: Neighborhood Change: What Does the Research Show?